In March 2017, we honored our 2017 neighbors of longstanding, Stanley Weiss and Ben and Pegi Gorelick. Hedy Campbell's remarks at that ceremony are reproduced below. It was a visit from a Panamanian he’d met during his military service that sealed Stanley Weiss’s fate. The friend was coming to visit a fellow Panamanian who’d found her way to New York some years earlier, and happened to live on W. 105th St. When Stanley arrived there to meet his visiting friend, he also met the New Yorker. Two years later, they married. Six years after that, after having moved from a hotel room on W. 97th Street to a studio on W. 98th, to a one bedroom on W. 105th, Stanley and Nancy moved into 885 West End Avenue. Nancy and Stanley lived there together ever since, until Nancy passed away a few years ago. From that home base, Stanley pursued his career as a lawyer, representing a variety of the city’s most well-known restaurants. In the 1960s, working on behalf of Maxwell’s Plum, he was instrumental in getting New York City’s zoning laws changed, paving the way for enclosed sidewalk cafes. Soon after moving into the building, he helped organize tenants to work as doormen on four-hour shifts in the building’s lobby, in order to “keep the hooligans out.” Those tenant-doorman shifts continued until an official doorman was hired in the mid-1990s. Meanwhile, Stanley used his legal expertise toward securing a good deal for existing tenants when the building went co-op. 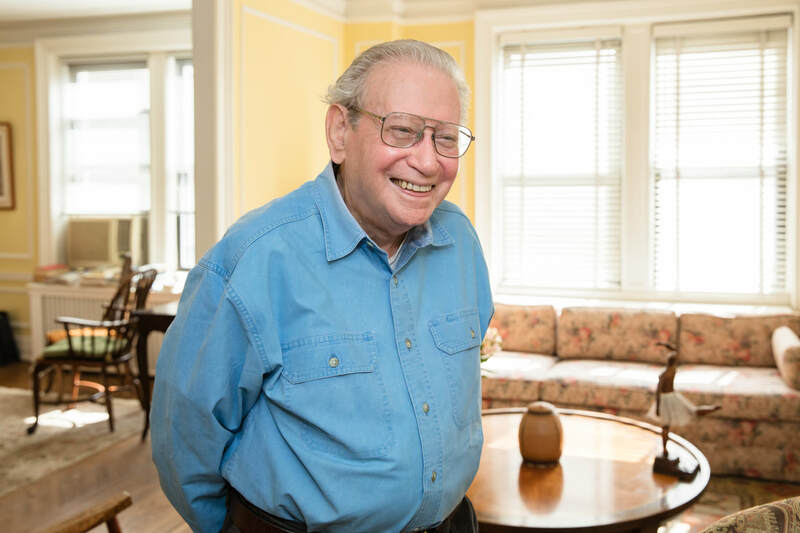 Stanley is a former board member of the Bloomingdale House of Music, enjoys concerts, theater, and cooking, and is an active participant in several Bloomingale Aging in Place (BAiP) groups. He says that in the time that he’s lived here, the feel of the neighborhood hasn’t changed, identifying the continuing presence of mom-and-pop shops, the overall liberalism, and the residents’ bookishness in particular (more books are bought by people who live in 10025 than in any other U.S zip code, he reported). The biggest differences, he observed, are the quality of the buildings and the presence of the chain stores. Like Stanley, Ben and Pegi Gorelick also found their apartment thanks to a tip from a friend and a quirk of characteristically New York fate. They were living in the Village in a one-bedroom apartment in a converted church. Pegi was a few weeks shy of delivering their first child. There was a transit strike. A friend who also happened to be the daughter-in-law of someone who was moving out of 875 mentioned the new vacancy. Pegi and Ben spent hours in the car in order to come see the place that same day. When they saw it, Pegi couldn’t imagine how they would ever fill it. Three weeks later, when their daughter was born, some of that empty space was spoken for. A second daughter born a few years later helped the process along. Now the space is filled with books and their extensive collection of art, much of it made by Pegi. Pegi recalls that the transition to our blocks was difficult. The Upper West Side vibe was very different from what they were used to downtown. It was so, so… quiet! And the buildings were so much larger. And safety was a serious concern. It wasn’t unusual for the parents of their children’s East Side schoolmates to decline play dates, as coming across to the West Side was too risky. Obviously, they acclimated and the neighborhood improved. They’ve been here ever since, and one of their daughters, now grown, has her own apartment in the building. The other lives a bit to the south in Chelsea, but regularly makes the trip all the way uptown with Pegi and Ben’s four-year-old twin grandchildren. Pegi and Ben remarked on several differences in the neighborhood since they moved in. The decrease in the number of movie theaters is one. There used to be a whole bunch of them between 86th Street and 110th Street. They also remembered that there was a pizza parlor on Broadway and 103rd that paid its employees in prayers and good wishes, and a bar with a daybed so that the owner could keep an eye on his very elderly mother while he poured drinks. Neither is a common business practice today, to be sure. 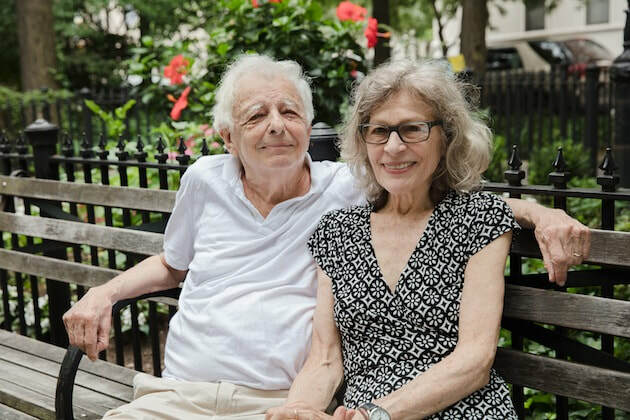 The renovation of Straus Park is a huge change for the better, especially now that Ben and Pegi have time and opportunity to spend pleasant afternoons there. They believe that the character of the neighborhood, which they described as “comfortable and relaxed, and politically progressive,” remains unchanged, as have their “smart, involved, nice” neighbors in the building, which seems to them to have little turnover. Because their apartment faces east, with a row of townhouses across West End Ave., the abundance of light and quiet in their home has remained the same as well, lucky for them!